Jean-Luc Godard’s ferocious run of ground breaking 1960s commercial features neared a terminus point as the filmmaker turned his gaze onto the nascent left-wing student organisations coalescing on university campuses across France and environs. The resulting film was his searing masterpiece La Chinoise — a mordant satire, pedagogical treatise, political tract, and pop-artwork-“plus blood” rolled into one. It’s early ’67 and Radio Peking’s in the air for the Aden Arabie Cell, a Maoist collective holed up in a sprawling flat on Paris’s rue de Miromesnil — the newly purchased actual residence of Godard and then-wife and star Anne Wiazemsky. Véronique (Wiazemsky) and her comrades, including Jean-Pierre Léaud (The 400 Blows, Out 1) and Juliet Berto (Out 1, Céline and Julie Go Boating) lead a series of discussions and performative skits addressing matters of French colonialism, American imperialism, and the broader conflict raging in Vietnam. A meditation on the efficacy of violent protest and militant counteraction played out between Wiazemsky (conducted by Godard via radio-earpiece), and her then-tutor philosopher Francis Jeanson gives way to a plot to assassinate the Soviet minister of culture — a red-handed point of no going-back on the path to complete radicalisation. FIRST PRESSING ONLY: Illustrated collector's booklet containing vintage writing by and discussions with Jean-Luc Godard and beyond: passing through the landmark “Struggling on Two Fronts” interview; the “Two Hours with Jean-Luc Godard” journal; notes on Anne Wiazemsky’s 2012 memoir-novel Une année studieuse [A Studious Year]; a tribute to Wiazemsky, Léaud, and Berto; vintage archival imagery; newly translated material; and more. 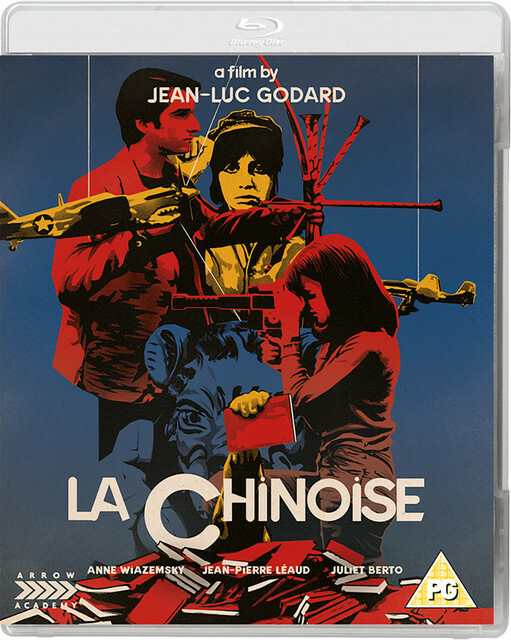 Confirmed by Watershed for their upcoming Cinema Rediscovered festival: Arrow Academy will be releasing Godard's La Chinoise later in the year (probably Q3 or early Q4). This is the first stand alone release by Arrow that I have seen with a silent static menu. I prefer this (which is the norm for discs in box sets by Arrow) because I find the menu music irritating due to its higher volume in relation to the volume of the actual disc content. I have only skimmed the film but it looks great. I’ll check it with the commentary this weekend. It’s Nice to hear the complete Mao Mao song on the trailer and I always appreciate archive, behind-the-scenes special features. This disc has a fine set of extras, old and new. Well done Arrow. Can we please have LES CARABINIERS soon? In the commentary for this, James Quandt namechecks Althusser every five minutes, but unfortunately never bothered to find out how to pronounce his name, which kind of makes the whole commentary sound suspect. Denitza Bantcheva's critical reading of the film is interesting, though it takes the possibly heretical view that the film's revolutionaries are obviously idiots. Charles Bitsch is also refreshing, in talking frankly about not liking Godard as a person or a filmmaker. The Michel Semianako interview is the longest and the most in-depth about this particular film, and has lots of good information about where Godard's head was (probably) at during this pivotal time of his career. Does he mean that Godard intended them to be idiots or that they just happen to be? I've always enjoyed it as a story of morons, but I've never gotten the sense that was how Godard intended it. Bantcheva seems to go a lot further than that reading. She doesn't just claim that they're spoilt, shallow dilettantes, but that the arguments they're spouting and slogans they're parroting are transparently stupid. I have no doubt, given what came after this, that Godard had at least some genuine admiration for these kids and for the aforementioned arguments and slogans. Marker's Le fond de l'air est rouge is the film where you'll find some pretty harsh, yet still largely friendly, criticism (from the left) of French Maoists and their revolutionary conceits. Part of it is addressed to a fellow filmmaker who is very obviously Godard although he's not named.